The primary goal of QNX Neutrino is to deliver the open systems POSIX API in a robust, scalable form suitable for a wide range of systems — from tiny, resource-constrained embedded systems to high-end distributed computing environments. The OS supports several processor families, including x86, ARM, XScale, PowerPC, MIPS, and SH-4. For mission-critical applications, a robust architecture is also fundamental, so the OS makes flexible and complete use of MMU hardware. Of course, simply setting out these goals doesn't guarantee results. We invite you to read through this System Architecture guide to get a feel for our implementation approach and the design trade-offs chosen to achieve these goals. When you reach the end of this guide, we think you'll agree that QNX Neutrino is the first OS product of its kind to truly deliver open systems standards, wide scalability, and high reliability. According to a prevailing myth, if you scratch a POSIX operating system, you'll find UNIX beneath the surface! A POSIX OS is therefore too large and unsuitable for embedded systems. Thanks to the precise specification within the standards, as well as the availability of POSIX test suites, nontraditional OS architectures can provide a POSIX API without adopting the traditional UNIX kernel. Compare any two POSIX systems and they'll look very much alike — they'll have many of the same functions, utilities, etc. But when it comes to performance or reliability, they may be as different as night and day. Architecture makes the difference. Despite its decidedly non-UNIX architecture, QNX Neutrino implements the standard POSIX API. By adopting a microkernel architecture, the OS delivers this API in a form easily scaled down for realtime embedded systems or incrementally scaled up, as required. Since you can readily scale a microkernel OS simply by including or omitting the particular processes that provide the functionality required, you can use a single microkernel OS for a much wider range of applications than a realtime executive. Product development often takes the form of creating a “product line,” with successive models providing greater functionality. Rather than be forced to change operating systems for each version of the product, developers using a microkernel OS can easily scale the system as needed — by adding filesystems, networking, graphical user interfaces, and other technologies. A common problem with realtime application development is that each realtime OS tends to come equipped with its own proprietary API. In the absence of industry standards, this isn't an unusual state for a competitive marketplace to evolve into, since surveys of the realtime marketplace regularly show heavy use of in-house proprietary operating systems. POSIX represents a chance to unify this marketplace. 1003.1 — defines the API for process management, device I/O, filesystem I/O, and basic IPC. This encompasses what might be described as the base functionality of a UNIX OS, serving as a useful standard for many applications. From a C-language programming perspective, ANSI X3J11 C is assumed as a starting point, and then the various aspects of managing processes, files, and tty devices are detailed beyond what ANSI C specifies. Realtime Extensions — defines a set of realtime extensions to the base 1003.1 standard. These extensions consist of semaphores, prioritized process scheduling, realtime extensions to signals, high-resolution timer control, enhanced IPC primitives, synchronous and asynchronous I/O, and a recommendation for realtime contiguous file support. Threads — further extends the POSIX environment to include the creation and management of multiple threads of execution within a given address space. Additional Realtime Extensions — defines further extensions to the realtime standard. Facilities such as attaching interrupt handlers are described. Application Environment Profiles — defines several AEPs ( Realtime AEP , Embedded Systems AEP , etc.) of the POSIX environment to suit different embedded capability sets. These profiles represent embedded OSs with/without filesystems and other capabilities. For an up-to-date status of the many POSIX drafts/standards documents, see the PASC (Portable Applications Standards Committee of the IEEE Computer Society) report at http://pasc.opengroup.org/standing/sd11.html. Apart from any “bandwagon” motive for adopting industry standards, there are several specific advantages to applying the POSIX standard to the embedded realtime marketplace. Hardware manufacturers are loath to choose a single-sourced hardware component because of the risks implied if that source discontinues production. For the same reason, manufacturers shouldn't be tied to a single-sourced, proprietary OS simply because their application source code isn't portable to other OSs. By building applications to the POSIX standards, developers can use OSs from multiple vendors. Application source code can be readily ported from platform to platform and from OS to OS, provided that developers avoid using OS-specific extensions. Using a common API for embedded development, programmers experienced with one realtime OS can directly apply their skill sets to other projects involving other processors and operating systems. In addition, programmers with UNIX or POSIX experience can easily work on embedded realtime systems, since the nonrealtime portion of the realtime OS's API is already familiar territory. With the addition of interface hardware similar to the target runtime system, a workstation running a POSIX OS can become a functional superset of the embedded system. As a result, the application can be conveniently developed on the self-hosted desktop system. Even in a cross-hosted development environment, the API remains essentially the same. Regardless of the particular host (QNX Neutrino, Linux, Windows,...) or the target (x86, ARM, MIPS, PowerPC, ...), the programmer doesn't need to worry about platform-specific endian, alignment, or I/O issues. The main responsibility of an operating system is to manage a computer's resources. All activities in the system — scheduling application programs, writing files to disk, sending data across a network, and so on — should function together as seamlessly and transparently as possible. Some environments call for more rigorous resource management and scheduling than others. Realtime applications, for instance, depend on the OS to handle multiple events and to ensure that the system responds to those events within predictable time limits. The more responsive the OS, the more “time” a realtime application has to meet its deadlines. QNX Neutrino is ideal for embedded realtime applications. It can be scaled to very small sizes and provides multitasking, threads, priority-driven preemptive scheduling, and fast context-switching — all essential ingredients of an embedded realtime system. Moreover, the OS delivers these capabilities with a POSIX-standard API; there's no need to forgo standards in order to achieve a small system. QNX Neutrino is also remarkably flexible. Developers can easily customize the OS to meet the needs of their applications. From a “bare-bones” configuration of a microkernel with a few small modules to a full-blown network-wide system equipped to serve hundreds of users, you're free to set up your system to use only those resources you require to tackle the job at hand. Buzzwords often fall in and out of fashion. Vendors tend to enthusiastically apply the buzzwords of the day to their products, whether the terms actually fit or not. The term “microkernel” has become fashionable. Although many new operating systems are said to be “microkernels” (or even “nanokernels”), the term may not mean very much without a clear definition. Let's try to define the term. A microkernel OS is structured as a tiny kernel that provides the minimal services used by a team of optional cooperating processes, which in turn provide the higher-level OS functionality. The microkernel itself lacks filesystems and many other services normally expected of an OS — those services are provided by optional processes. The real goal in designing a microkernel OS is not simply to “make it small.” A microkernel OS embodies a fundamental change in the approach to delivering OS functionality. Modularity is the key, size is but a side effect. To call any kernel a “microkernel” simply because it happens to be small would miss the point entirely. Since the IPC services provided by the microkernel are used to “glue” the OS itself together, the performance and flexibility of those services govern the performance of the resulting OS. With the exception of those IPC services, a microkernel is roughly comparable to a realtime executive, both in terms of the services provided and in their realtime performance. The microkernel differs from an executive in how the IPC services are used to extend the functionality of the kernel with additional, service-providing processes. Since the OS is implemented as a team of cooperating processes managed by the microkernel, user-written processes can serve both as applications and as processes that extend the underlying OS functionality for industry-specific applications. The OS itself becomes “open” and easily extensible. Moreover, user-written extensions to the OS won't affect the fundamental reliability of the core OS. A difficulty for many realtime executives implementing the POSIX 1003.1 standard is that their runtime environment is typically a single-process, multiple-threaded model, with unprotected memory between threads. Such an environment is only a subset of the multi-process model that POSIX assumes; it cannot support the fork() function. In contrast, QNX Neutrino fully utilizes an MMU to deliver the complete POSIX process model in a protected environment. Conventional executives offer no memory protection. In a monolithic OS, system processes have no protection. A microkernel provides complete memory protection. The first version of the QNX OS was shipped in 1981. With each successive product revision, we have applied the experience from previous product generations to the latest incarnation: QNX Neutrino, our most capable, scalable OS to date. We believe that this time-tested experience is what enables the QNX Neutrino OS to deliver the functionality it does using the limited resources it consumes. The QNX Neutrino OS consists of a small microkernel managing a group of cooperating processes. As the following illustration shows, the structure looks more like a team than a hierarchy, as several “players” of equal rank interact with each other through the coordinating kernel. 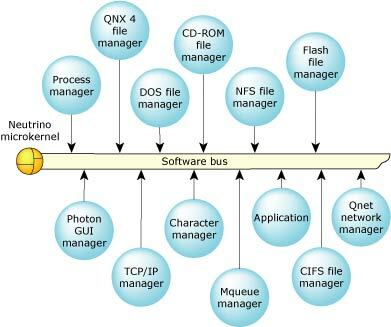 QNX Neutrino acts as a kind of “software bus” that lets you dynamically plug in/out OS modules whenever they're needed. The kernel is the heart of any operating system. In some systems, the “kernel” comprises so many functions that for all intents and purposes it is the entire operating system! message-passing services — the microkernel handles the routing of all messages between all threads throughout the entire system. scheduling services — the microkernel schedules threads for execution using the various POSIX realtime scheduling algorithms. timer services — the microkernel provides the rich set of POSIX timer services. process management services — the microkernel and the process manager together form a unit (called procnto). The process manager portion is responsible for managing processes, memory, and the pathname space. System processes are essentially indistinguishable from any user-written program — they use the same public API and kernel services available to any (suitably privileged) user process. It is this architecture that gives QNX Neutrino unparalleled extensibility. Since most OS services are provided by standard system processes, it's very simple to augment the OS itself: just write new programs to provide new OS services. In fact, the boundary between the operating system and the application can become very blurred. The only real difference between system services and applications is that OS services manage resources for clients. Suppose you've written a database server — how should such a process be classified? Just as a filesystem accepts requests (via messages) to open files and read or write data, so too would a database server. While the requests to the database server may be more sophisticated, both servers are very much the same in that they provide an API (implemented by messages) that clients use to access a resource. Both are independent processes that can be written by an end-user and started and stopped on an as-needed basis. A database server might be considered a system process at one installation, and an application at another. It really doesn't matter! The important point is that the OS allows such processes to be implemented cleanly, with no need for modifications to the standard components of the OS itself. For developers creating custom embedded systems, this provides the flexibility to extend the OS in directions that are uniquely useful to their applications, without needing access to OS source code. 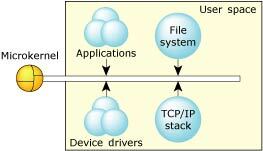 Device drivers allow the OS and application programs to make use of the underlying hardware in a generic way (e.g. a disk drive, a network interface). While most OSs require device drivers to be tightly bound into the OS itself, device drivers for QNX Neutrino can be started and stopped as standard processes. As a result, adding device drivers doesn't affect any other part of the OS — drivers can be developed and debugged like any other application. When several threads run concurrently, as in typical realtime multitasking environments, the OS must provide mechanisms to allow them to communicate with each other. Interprocess communication (IPC) is the key to designing an application as a set of cooperating processes in which each process handles one well-defined part of the whole. The OS provides a simple but powerful set of IPC capabilities that greatly simplify the job of developing applications made up of cooperating processes. For more information, see the Interprocess Communication (IPC) chapter. QNX was the first commercial operating system of its kind to make use of message passing as the fundamental means of IPC. The OS owes much of its power, simplicity, and elegance to the complete integration of the message-passing method throughout the entire system. In QNX Neutrino, a message is a parcel of bytes passed from one process to another. The OS attaches no special meaning to the content of a message — the data in a message has meaning for the sender of the message and for its receiver, but for no one else. Message passing not only allows processes to pass data to each other, but also provides a means of synchronizing the execution of several processes. As they send, receive, and reply to messages, processes undergo various “changes of state” that affect when, and for how long, they may run. Knowing their states and priorities, the microkernel can schedule all processes as efficiently as possible to make the most of available CPU resources. This single, consistent method — message-passing — is thus constantly operative throughout the entire system. Realtime and other mission-critical applications generally require a dependable form of IPC, because the processes that make up such applications are so strongly interrelated. The discipline imposed by QNX Neutrino's message-passing design helps bring order and greater reliability to applications. In its simplest form, local area networking provides a mechanism for sharing files and peripheral devices among several interconnected computers. QNX Neutrino goes far beyond this simple concept and integrates the entire network into a single, homogeneous set of resources. Any thread on any machine in the network can directly make use of any resource on any other machine. From the application's perspective, there's no difference between a local or remote resource — no special facilities need to be built into applications to allow them to make use of remote resources. Users may access files anywhere on the network, take advantage of any peripheral device, and run applications on any machine on the network (provided they have the appropriate authority). Processes can communicate in the same manner anywhere throughout the entire network. Again, the OS's all-pervasive message-passing IPC accounts for such fluid, transparent networking. QNX Neutrino is designed from the ground up as a network-wide operating system. In some ways, a native QNX Neutrino network feels more like a mainframe computer than a set of individual micros. Users are simply aware of a large set of resources available for use by any application. But unlike a mainframe, QNX Neutrino provides a highly responsive environment, since the appropriate amount of computing power can be made available at each node to meet the needs of each user. In a mission-critical environment, for example, applications that control realtime I/O devices may require more performance than other, less critical, applications, such as a web browser. The network is responsive enough to support both types of applications at the same time — the OS lets you focus computing power on the devices in your hard realtime system where and when it's needed, without sacrificing concurrent connectivity to the desktop. Moreover, critical aspects of realtime computing, such as priority inheritance, function seamlessly across a QNX Neutrino network, regardless of the physical media employed (switch fabric, serial, etc.). QNX Neutrino networks can be put together using various hardware and industry-standard protocols. Since these are completely transparent to application programs and users, new network architectures can be introduced at any time without disturbing the OS. Each node in the network is assigned a unique name that becomes its identifier. This name is the only visible means to determine whether the OS is running as a network or as a standalone operating system. This degree of transparency is yet another example of the distinctive power of QNX Neutrino's message-passing architecture. In many systems, important functions such as networking, IPC, or even message passing are built on top of the OS, rather than integrated directly into its core. The result is often an awkward, inefficient “double standard” interface, whereby communication between processes is one thing, while penetrating the private interface of a mysterious monolithic kernel is another matter altogether. In contrast to monolithic systems, QNX Neutrino is grounded on the principle that effective communication is the key to effective operation. Message passing thus forms the cornerstone of our microkernel architecture and enhances the efficiency of all transactions among all processes throughout the entire system, whether across a PC backplane or across a mile of twisted pair.